Curly Tale Fine Art - Laura Colors "Lucky Seven"
Laura Colors is the work of surrealist painter Laura Parsons. She is also a partner in the artist collective 64 Colors. 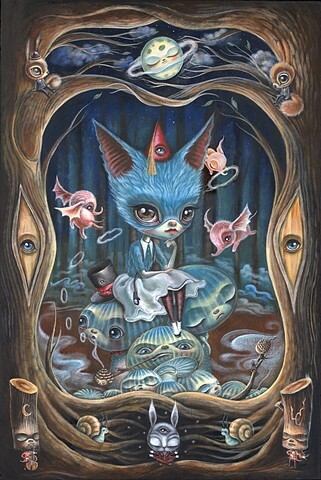 Inspired by fairytales, classic animation, nature, and the woods surrounding her studio, her work is a result of many hours spent creating characters, sculpts, vinyl figures, and fantasy worlds. Laura is a classically trained artist, but believes she has learned more through years of work in illustration, graphics and exploring new mediums on her own. Lauras paintings and vinyl figures are in many private collections and her work has been show in galleries all over the world.